Every morning when I sit in my office, for about two hours I hear the non-stop chirping and tweeting of birds. 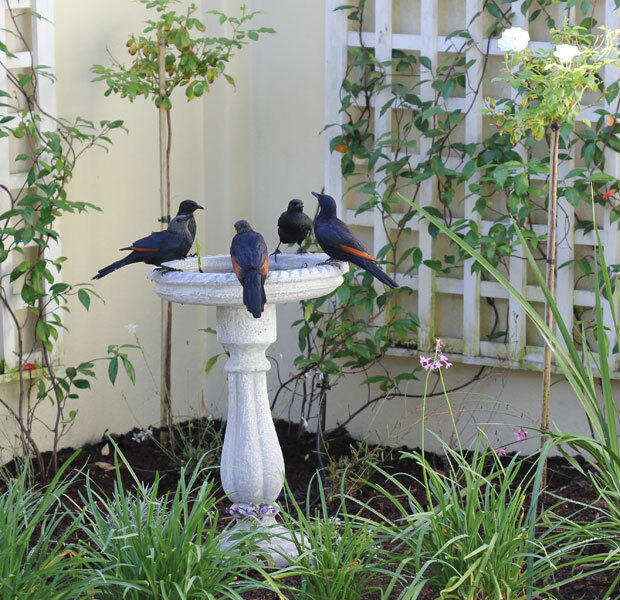 They have three bird baths which are situated in the Water Feature (in the side garden) which they seem to like but I’ve noticed that they prefer the trees in the front garden (the Frangipani and Willow trees in particular). I recently added two free standing bird baths to the front garden for them but up until today had never seen them being used by the birds. Until today … and use them they did! What a lovely way to start my day – with a cup of coffee and camera in hand they allowed me to sit quietly whilst they went about their morning ritual at the bath. A few days ago I put a cutting of a plant in the bath as I assumed they weren’t using it – well one of them decided it needed to be taken out – he picked it up and flew off with it, taking it into the Willow Tree! Can’t believe you got a pic of the bird making off with your cutting. I thought you’d guessed that that was what had happened … not actually caught them in the act! Glad to see that the birds are using the new baths. Now they’re spolied for choice. Lovely shot of the birds! Bravo. Great shot. Amazing pictures. Toooo sweet! Love the pic of the bird making off with the plant. Thanks Margie! It was a lucky shot. Too cute! Love seeing birds in a garden, Happy Days! I love your photos. Those birds look like they are all being so cordial to each other. Considerate too taking the cutting. Red wing starlings. Coming down to you from the mountain. We had them in Camps Bay. 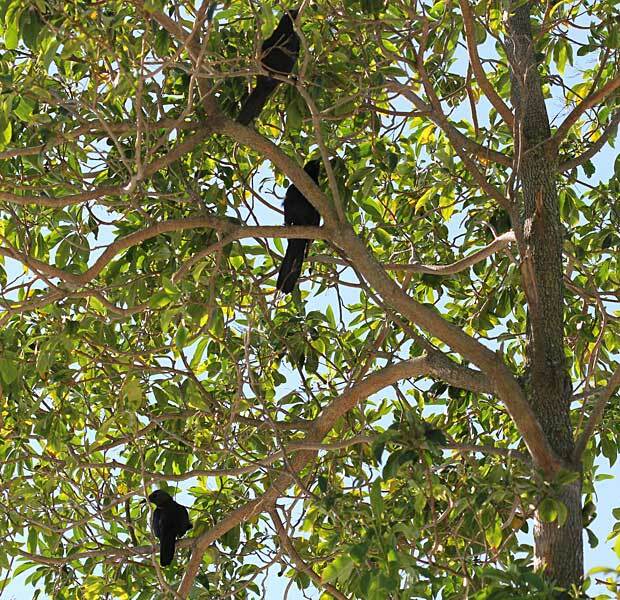 These are indigenous, not the invasive European starlings that Cecil John Rhodes so kindly brought us. Ah … Thanks Diana! I was hoping you would recognise them! These birds are always here. They love my garden, front side and back. We also have little humming birds (I think) long tails, small yellow / colourful birds – but difficult to catch on camera (for me) And of course doves … we have lots of those too and Hadeda! Dexter chases the Hadeda when he sees them so they don’t stay long but he ignores the other birds as does my cat – both just watch them the birds with me … I love the chirping and tweeting that goes on. (Hummingbirds live across the pond). Ours are called sunbirds. The one with the really long OTT tail is a sugarbird – they like the nectar of the suikerbossie, if you have proteas? So many of them! How fabulous to have birds in the birdbath. I usually have cats in the birdbath, so I don’t try to entice the birds there. So funny! Cats in the bird bath! Fortunately my Cat thinks he is a prince and those baths don’t fit into his idea of belonging in a “Prince’s boudoir”. I love your photo! Got that action shot – wow! I also love the birds in my garden, especially when they bathe in the birth bath. I also notice that when the one in the front is empty, the pigeons come and sit on the office window – almost reminding me to go and water! The birds in the garden make me happy! Sometimes I go and sit and wait for them and if they dont come (like now in winter) I feel a bit sad. I think I need to start a feeding routine like you do with the seeds … maybe they will come regularly then. I love foreign bird photos. I also love (and hate) the goofy things that birds do sometimes. Lucky capture! You also remind me I need a new birdbath this year too. Hi Alan – It was a lucky capture – I was very excited about getting that shot. I do love my bird visits but they leave an awful mess when they bathe in the side pond area. 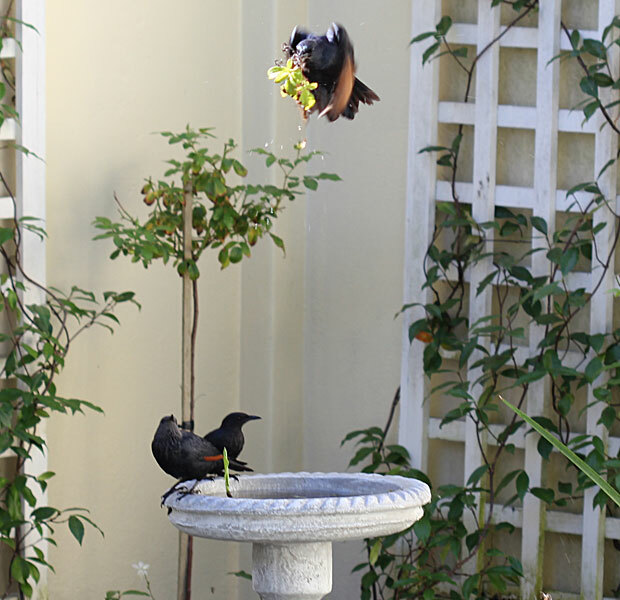 I’ll be a lot happier if they use these bird baths instead – their mess is not noticeable here. What kind of birds are those. I love the splash of red in the wing. I love to hear the birds when I’m working too. Very uplifting. I’m not sure what these birds are? They remind me too much of our grackles and starlings tho that I’m having a fit with right now. Once they arrive, they want to take over the garden. Hi Kathleen – they do take over! And they make a huge mess too. But … they are quite cute and I do enjoy them, if not their mess. We also get little birds (sunbirds I think they are) but they are less easy to photograph. Have to get a zoom lens for that. These are some very wonderful captures of birds during conference.